I got those Batperson Pajamas! 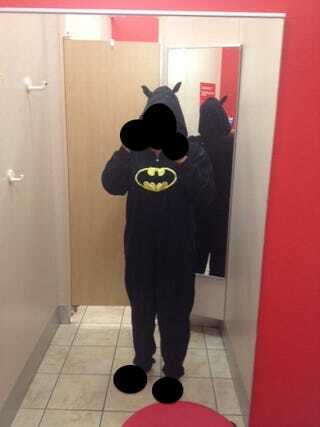 Now that I've had a chance to breathe about the carts in the parking space, I can show off my new Batperson pajamas! I'm going as Batwoman as I am a woman, but these are decidedly unisex pajamas even though they were technically in the women's section. I was inspired by Spookylicious who was a divine set of penguin footie pajamas and they looked comfy so I got some of my own. I'll be wearing them to my Halloween activity-an outdoor screening of Scream. Mine don't have feet but I'm actually glad because I'll need to wear regular shoes as I'll be in the grass. I mentioned earlier that I might perch on things and randomly state, "I'm Batwoman" in my most gravelly voice. This has happened and it was glorious. I may have gone a bit crazy with the black ovals.